Hi everyone! 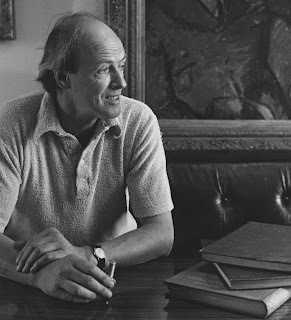 As I'm sure many of you know, today is a special day, because if Roald Dahl were alive today, he would be 100 years old. Working in the children's room of a public library, I get the joy of constantly introducing new readers to Roald Dahl's work. 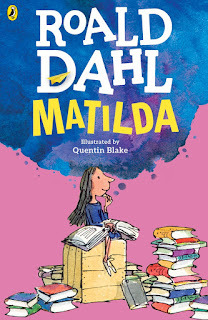 I've talked about this before, but Matilda is my all time favorite book. It's the book that got me interested in reading as a young child. Today, I'm lucky enough to share the passage that made Matilda my all time favorite book. I might even delve deeper into natural history and say, “The periodical cicada spends six years as a grub underground, and no more than six days as a free creature of sunlight and air. Your son Wilfred has spent six years as a grub in this school and we are still waiting for him to emerge from the chrysalis.” A particularly poisonous little girl might sting me into saying, “Fiona has the same glacial beauty as an iceberg, but unlike the iceberg, she has absolutely nothing below the surface.” I think I might enjoy writing end-of-term reports for the stinkers in my class. But enough of that. We have to get on. Occassionally one comes across parents who take the opposite line, who show no interest at all in their children, and these of course are far worse than the doting ones. Mr and Mrs Wormwood were two such parents. They had a son called Michael and a daughter called Matilda, and the parents looked upon Matilda in particular as nothing more than a scab. A scab is something you have to put up with until the time comes when you can pick it off and flick it away. Mr and Mrs Wormwood looked forward enormously to the time when they could pick their little daughter off and flick her away, preferably into the next county or even further than that. “Where are the children’s books, please?” Matilda asked. Mrs Phelps looked along the shelves, taking her time, She didn’t quite know what to bring out. How, she asked herself, does one choose a famous grown-up book for a four-year-old girl? Her first thought was to pick a young teenager’s romance of the kind that is written for fifteen-year-old school girls, but for some reason she found herself instinctively walking past that particular shelf. 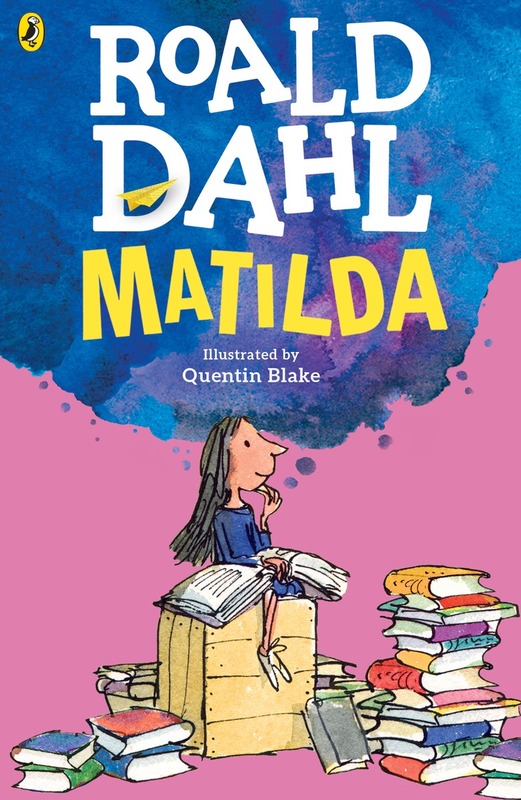 From then on, Matilda would visit the library only once a week in order to take out new books and return the old ones. Her own small bedroom now became her reading-room and there she would sit and read most afternoons, often with a mug of hot chocolate beside her. She was not quite tall enough to reach things around the kitchen, but she kept a small box in the outhouse which she brought in and stood on in order to get whatever she wanted. Mostly it was hot chocolate she made, warming the milk in a saucepan on the stove before mixing it. Occasionally she made Bovril or Ovaltine. It was pleasant to take a hot drink up to her room and have it beside her as she sat in her silent room reading in the empty house in the afternoons. The books transported her into new worlds and introduced her to amazing people who lived exciting lives. She went on olden-day sailing ships with Joseph Conrad. She went to Africa with Ernest Hemingway and to India with Rudyard Kipling. She travelled all over the world while sitting in her little room in an English Village. Lucy: “I remember waking up in the night and going to the bathroom and seeing the glow of the light in the little [writing] hut while it was still dark outside. “His hut was a sacred place. ... We were all allowed to go in there, but we only disturbed him when we absolutely needed to because he used to say that his hut was his nest. You would walk in and the smells were so familiar — that very old paper from filing cabinets. And he sat in his mother's old armchair and then put his feet up on an old leather trunk, and then on top of that he would get into an old down sleeping bag that he would put his legs into to keep him warm. “He then had a board that he made that he would rest on the arms of the armchair as a desk table and on top of that he had cut some billiard felt that was glued on top of it, and it was slightly carved out for where his tummy was. When he sat down ... the first thing he did was get a brush and brush the felt on his lap desk so it was all clean. “He always had six pencils with an electric sharpener that he would sharpen at the beginning of each session. His work sessions were very strict — he worked from 10 until 12 every day and then again from 3 until 5 every day. And that was it. Even if there was nothing to write he would still, as he would say, ‘put his bottom on the chair.’"